Standard electrical NEMA 1 construction, 110 or 230 volt 1 phase, with optional NEMA 4X immersion heaters. Digital indicating temperature controller. Optional gas, steam or explosion resistant heating available. 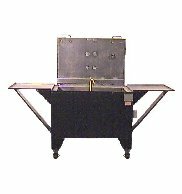 Standard construction of mild steel, 12 gauge inner tank double seam welded inside and out, 1 inch of insulation, outer shell of 16 gauge mild steel finished in Polane® polyurethane epoxy enamel. Full length stainless steel piano hinge on insulated automatic opening lid. Optional stainless steel construction 12 gauge type 304 stainless steel inner tank with all wetted parts including tank, shelves, and lid of type 304 stainless steel. Stainless construction designated by -SS at end of model number. Outer shell of 16 gauge mild steel finished in Polane® polyurethane enamel. MEDIUM VOLUME RECIRCULATION SYSTEM for filtration and manual washing. STANDARD AND CUSTOM DESIGNS to meet any requirements: virtually any dimension or layout requirements. Connecting conveyors in mild steel or stainless steel with drip pans available. Designed to fit YOUR production needs. HEAVY DUTY CONSTRUCTION features 12 gauge minimum inner tank construction with 16 gauge outer shell, three inches of insulation and insulated automatic lid.